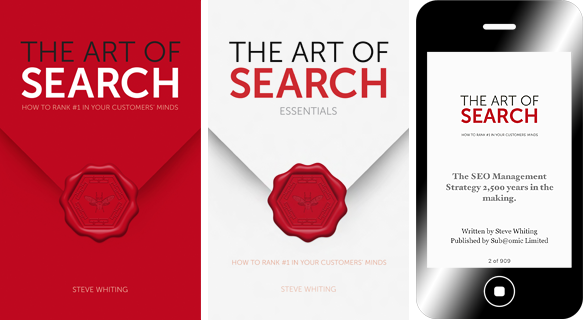 The Art of Search® is a brand new paperback and E^book about SEO (search engine optimisation) written by Steve Whiting who uses The Art of War to argue that website SEO is a strategic management issue and not a black art practiced by the techies. The book urges business leaders to develop and wield a strong website, to build an online fighting force that attacks the marketplace, that wins new business and so suppresses the competition. CEO Meets SEO - The Art of Search is an SEO management strategy written for business leaders in plain business English. Powerfully illustrated and thoughtfully paced with a comprehensive introduction and compelling appendices, the book explores and simplifies SEO through a direct comparison to strategic warfare based upon the 2,500 year old military treatise The Art of War. Download from Apple and read the full version with iBooks on your Mac, iPhone or iPad. 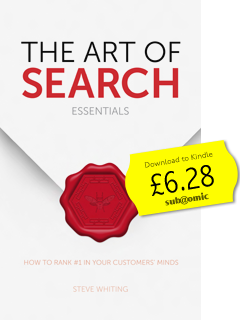 Launched exclusively through Amazon, this value-priced edition of the original SEO management strategy is the version to read when all you have time for is the core SEO strategy and not the discussion in which the original is wrapped. Install the free Kindle app and read The Art of Search - Essentials on any device. Using the legendary 2,500 year old Chinese text The Art of War this book explores and illustrates how a website can secure #1 search engine rankings when it is managed just as one would manage an army. The Art of Search is an SEO management strategy, a non-technical exploration of the competitive search engine landscape written for people in business who have websites which are losing business opportunities through poor search engine performance. Learn how to secure search engine supremacy by appointing a Search Commander who thinks like a Customer and thinks like a robot to take control of your website, champion your brand and put Search at the heart of your organisation. This book is different. This book makes SEO easy to understand and puts SEO back under the control of business owners. Most people 'learn' their SEO from the "snakeoil salespeople" who try to sell SEO like it's some kind of retrofit, plug-in or bolt-on to a website. It isn't. Getting to the top of Google is a strategic business issue. 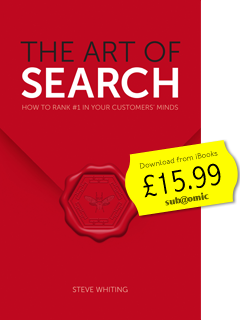 The Art of Search has been written for business leaders, website marketers and content strategists, this SEO book takes the topic of customer insight to a whole new level as it explores what business looks like from the context of the Customer. Steve Whiting's writing style litters the book with wonderful quirks and references to bring life and colour to an otherwise sterile topic. 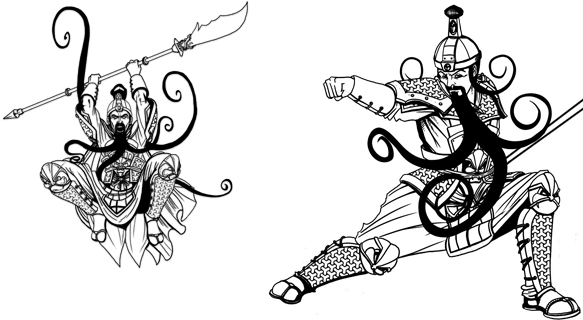 The reinterpretation of the writings of Sun Tzu results in a non-technical SEO management strategy offering many insightful, colourful and memorable SEO similes from here on Earth, from way up in the heavens and then out into space.